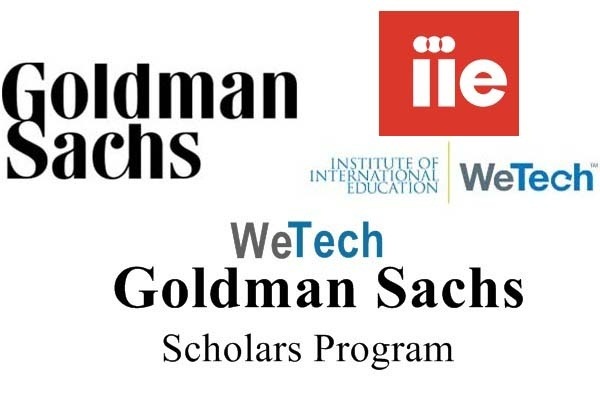 Goldman Sachs in collaboration with Institute of International Education (IIE) provides WeTech (Women Enhancing Technology) Goldman Sachs Scholars Program for Indian women for pursuing their undergraduate programs at a participating university in her second or third year of studies. WeTech, or Women Enhancing Technology, is a consortium of dedicated partners that is led by the Institute of International Education (IIE), to design and support a series of innovative activities to provide training, build networks and offer professional opportunities. WeTech helps women and girls enter and succeed in technology careers, with the goal of enhancing women’s talent and skills needed to fuel technological and economic growth. Launched at the Clinton Global Initiative Annual Meeting in 2013, WeTech has engaged 27 companies, 200 mentors, 50 schools and universities, and 10,000 participants in 21 countries to date. The Institute of International Education (IIE) is the leader in the world's most prestigious scholarship and fellowship programs, and Goldman Sachs (NYSE: GS), a leading global investment bank and active investor in India, that invests in young women and future leaders in information, communication and technology (ICT) in India. WeTech believes that providing young women university scholarships for degrees in the ICT sector has tremendous impact on their retention and success rate in their chosen field, at a time when the global tech industry desperately needs more women educated, trained and entering into ICT careers. Combining this financial support with a 6-month structured mentorship program will also enable these women to connect with professionals working in the field who can provide them with valuable advice, guidance, and support to ensure their success as they enter into technical careers after graduation. This scholarship is for 10 womens and each will receive a merit-based $1500 scholarship. The financial award may be used to cover fees associated with a student’s academic course of study and is not strictly limited to tuition. WeTech holds the right to stipulate fees disbursement and utilization structure. The scholarship recipients will also be expected to complete a 6-month virtual mentorship from approximately June/July through December of the current year. Scholars will be connected with experienced mentors from Goldman Sachs. For any related queries, mail at query@edugyd.com or Contact via Facebook @EduGyd or Twitter @EduGyd. Candidates could also log into EduGyd Forum section to ask experts and the community. For more details and application submission, visit WeTech Goldman Sachs Scholarship for Indian women.